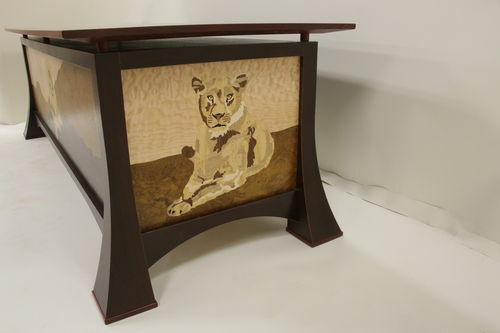 Here is a Lion theme desk that I just completed. The size is 30” tall x 36” wide x 96” long. This one took me several months to complete. The marquetry of the three lions has over 1000 different pieces of veneer. The reddish hardwood is Padauk, and the veneered base is out of Wenge. Thank you very much for looking!!! Just unreal (as usual). That is pretty incredible. 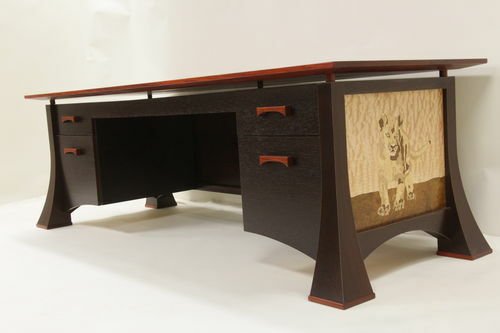 Beautiful marquetry work Dennis AND a wonderful desk design as well. Really inspiring work. I like the big marquetry. Seems I only do small marquetry. Wow Dennis! 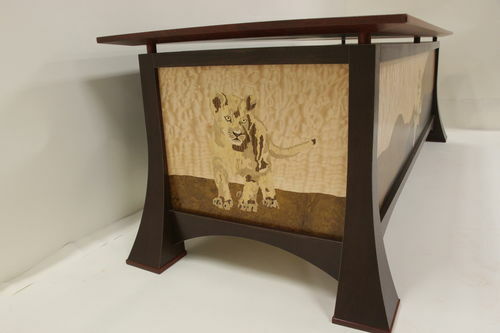 Totally ‘out of Africa’ in Marquetry design and cabinetry style. Well done!! Thank you for showing that masterpiece! It is absolutely beautiful! I am in awe of this. Shows an incredible level of skill and talent. -- ok, is it cut once measure twice, cut twice measure once???? I know....I'll just keep cutting until it's long enough. Beautiful build. How long did you need to build it? 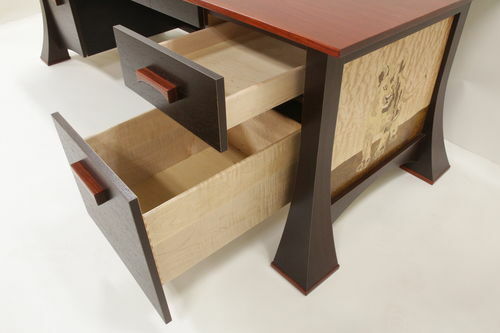 Beautiful work, the marquetry goes without saying but I really like that floating top. For me, little things like that take the design to the next level. Beautiful Dennis, very nice marquetry work for sure. No words needed here. Just sit back and enjoy the view. Awesome! Model Build #2 : The Hummer #6: Details And Bringing It Together! Tips for Watco Danish Oil cap?